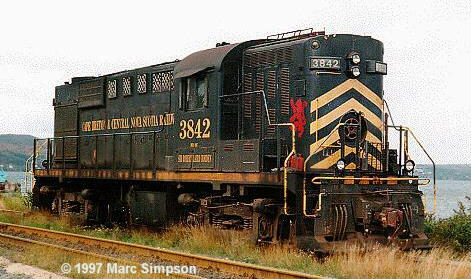 Cape Breton & Central Nova Scotia: all MLW units but one stored. Stephen Reeves reports (Jan 6th, 00): Cape Breton & Central Nova Scotia RS18 3842 has been laid up for a few months now. It needs new wheels to pass inspection but the CBNS does not want to spend the money to do the work. The rest of the unit still in reasonably good shape. The rest of the RS18's and C630M's are still sitting in the deadline (up for sale). No new news regarding their fate. The CBNS is now using six ex BN GP50's, one GP40, one GP18, two GP9's and two GP7u's. 2035 has been sold to Tri-Provinces Metal and was seen in a scrap yard in Humphrey's, Nova Scotia. Its trucks will be re-used as spares for CN's fleet of 8-40CMs. An unusal workplace for CBNS 2035: Goderich and Exter rented the big unit to supplement the small roster of three GP9. 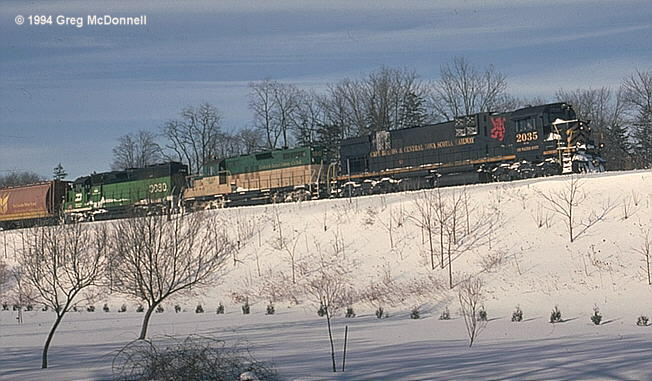 2nd unit is the G&E 180 followed by BN 3080 (GP40G). The train arrives here at Stratford/Ont. from Goderich, February 10th, 1994.